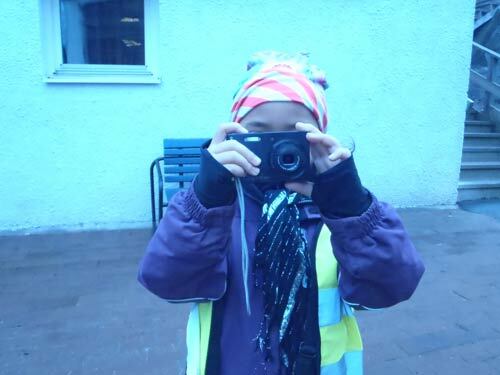 In February 2011 students and teachers at the School of Film Directing in Gothenburg started a Film School for children. 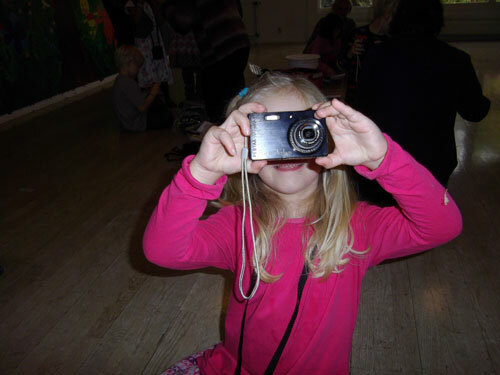 For almost a year now ten children at the ages 3-9 have been learning how to film every other Sunday. Parallel to this we have started a preschool with similar activities with twelve children at the age of five. The children born today automatically become part of the digital world. Just a couple of minutes after a child is born the first pictures show up on Facebook. 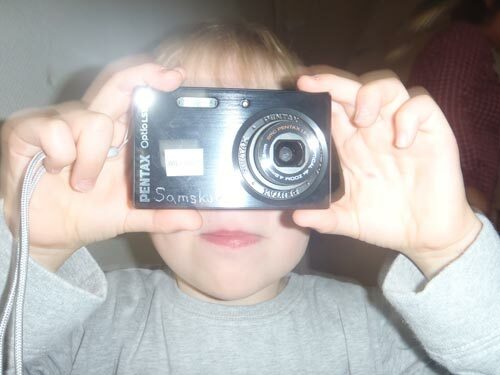 What if your child took as many pictures of you as you take of your child? And what if the children documented the activities of the kindergarten educators as intensely as they themselves are documented? What do the children learn by being so diligently documented? That they’re place is in front of the camera? It’s a question of democracy who depicts our world; whose images and perspectives become valid. We want to give the children a chance to be part of the digital arena as participants and thereby give them precedence to their own world. To get you're own camera. The children's film school begins. This is a camera you adopt as your own and it's brought home between gatherings. This is a major event. 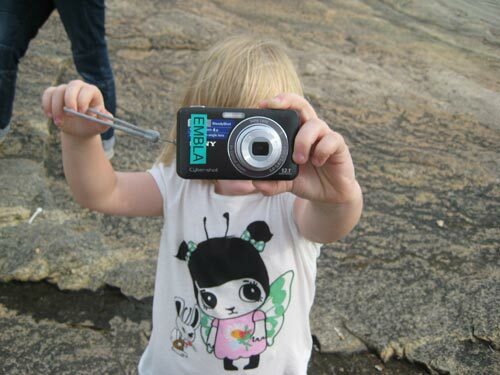 Twice we've witnessed the reverential moment when the children get their own cameras. This high-tech gadget for adults, like the mobile phone, is just as desirable for the hands of children, a camera of your won. It takes about a minute before every child in the room has taken a picture. During the next twenty minute all you, as an adult, have to do is watch. Everything in the room is documented. They immediately start experimenting with distance, camera hight and movement. 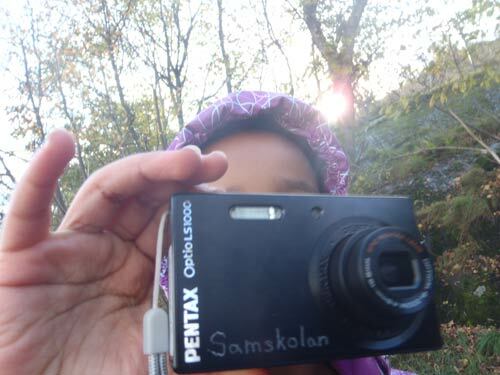 That all the children have a camera that they can bring home with them as if it where their own. That the educators base their work on the children's curiosity an encourage it. Learning by doing; first do - then reflect. Practice is central and seen as a source of knowledge. The children are directors - it's their vision. Presenting an individual task in front of the whole class. Group exercise. We study a specific aspect of filming. : sound, distance, perspective, effects, etc, by orchestrating a situation. The situation can be a series of obstacles they have to get through, filming a moving object or going somewhere and documenting the visit. Unique moment. Something that happens only once: for example an explosion or something that flies away. For us the unique moment is central. It happens only once and if you capture it on film, you do. If you don't, then you don't. The unique moment is important because it's a form for training you’re ability to concentrate. You study; knowing when that of interest is going to happen. Handling the technical aspects as it's happening is part of it. So, when they don't succeed in capturing the unique moment, how do you handle that? I was forced to thing back upon the eight times we've staged one of these unique moment and can't recall a single time I'd seen anyone being sad. I wonder why? The person who asked that question pointed at something essential. Maybe the fundament of artistic learning is cultivating a way of doing things where failure isn't an option. Failure should be seen as an incentive not as a defeat. Having failed is a given step towards realizing you're intentions. The whole artistic exercise is based upon the principle: try, try again, and again and again. It backfired, let's try doing it in differently next time. Try again. And again. If a failure is seen as a definitive defeat the process comes to a halt. At The Children's Film School there isn't one way of doing things. We don't advocate a certain style. We don't impose upon the children how things should be done. We provide possible ways of doing so they can get closer to their own intentions. When it comes to the unique moment we knew almost no one would be able to do it at the beginning of the term. 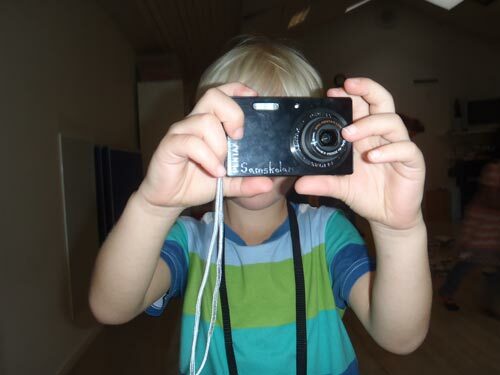 Since we knew it would be a recurring part of the course, we figured the children would eventually get it, based upon their own ability to capture a moment and get it on film. 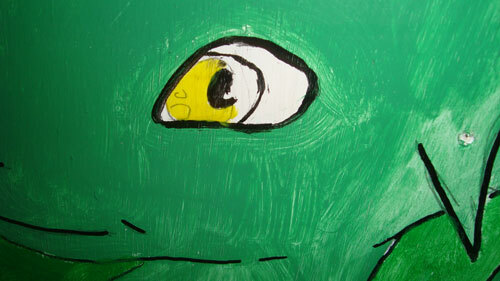 We prepare a lesson with the twelve preschool children and try to establish where a close-up of an eye has been shot. We look at the wall painting in front of us for at least a minute and can't find anything. Then we realize "we have to get down on our knees". We took for granted that the shoot was taken from our height of sight. Something happens within me when I see images taken from the height of the children's eyes. It concerns me when I realize how normal I find it to always see images from a camera perspective that resembles a grown person eye height and how different things are from a children's perspective. On the way to a treasure hunt on the bottom floor of the preschool. Twelve lively children, around the age of five, at the ready. When I put the image in to the computer afterwards I see that we've run into a bunch of eight year old girls. Our five year olds have documented it. 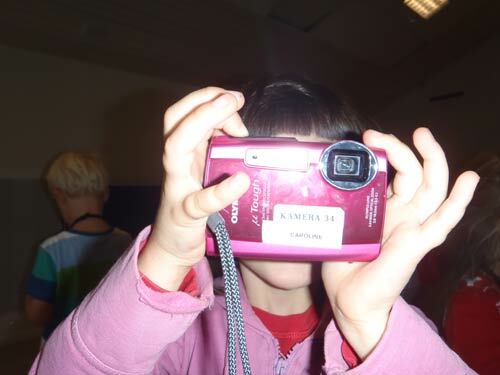 The eight year old girls relate to the camera in a completely different way than the five year olds. 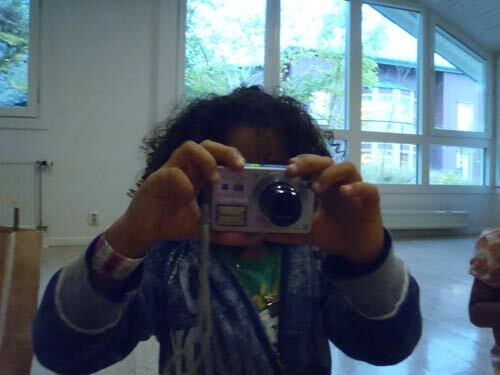 When the younger ones take pictures of each other it's very "matter of fact", straight forward shots. Pictures of people "in action". Curious, open minded pictures taken at play. The pictures of the eight year old girls are taken from below. The girls stand at the top of the stairs, our children at the bottom. The eight year old girls start posing straight away. Pouting with their lips and pushing forward their nonexistent breasts. 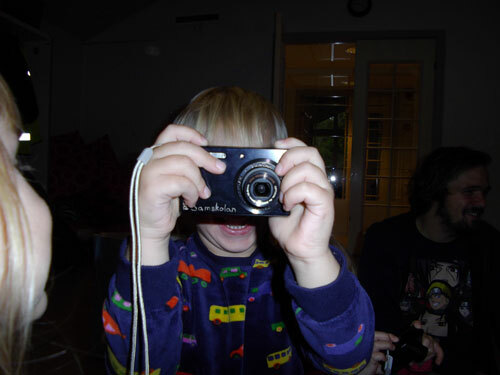 Would they have related to the camera differently had they started filming at the age of five? The camera as a researching tool. The younger children's pictures seldom seem to have the purpose of being shown later when they’re taken. The camera seems to be an instrument for discovering in it self, to study and be fascinated. And we who receive these images follow the child on that same journey. 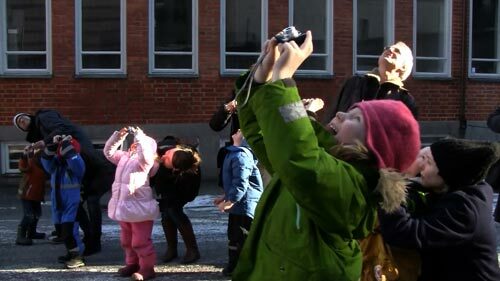 The children try different ways of approaching an object: spinning the camera around, running back and fourth, filming up side down, throwing the camera to the ground, all for the sake of finding out, how will it turn out? It's not certain that the camera is a vicarious eye. It might as well reassemble another body part, for example an arm. Then, when the children show the adults the pictures they've taken, through our feedback we can describe with words what the images tell us and how the children have done when they've been filming. In this way we can offer a vocabulary for describing what the children discover through their experiments; a vocabulary the children never would have had access to, had the pictures not been taken. I have several times marveled at the fact that I can spend two hour in the same room as the children and not even notice a piece of thread on the floor that almost all of them have documented. A socket in the wall or a door handle at the right height may be worthy of a detailed study, also hair, scalps, and the inside of mouths and ears. When the children bring the camera home they often want to document stuffed animals, their family and their room. Often the camera becomes familiar, like a friend who takes part in the games they play. Film as a subject in school. Today the image is the dominant for of communication for both children and in the adult world. Children consume a lot of images at an early age. 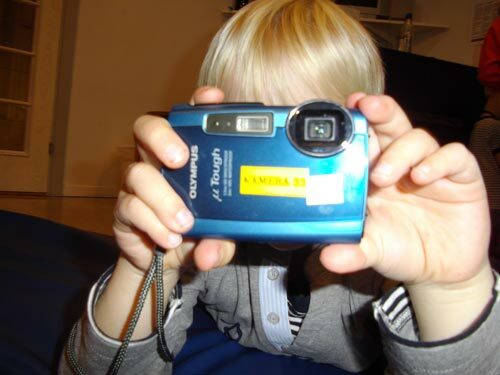 The simply understood technology of today’s mobile phones and computers have also made children into publicists and producers in the public arena, for example on the Internet. 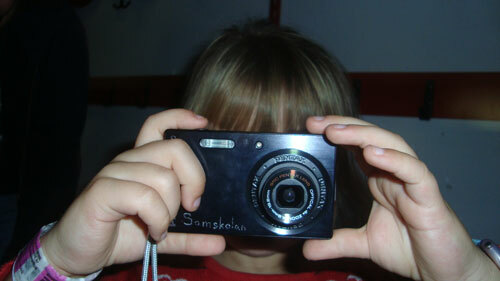 Absorbing this technology at a very early age is possible, as our film school and several other studies have shown. It's time for the Swedish school system to catch on to this now that the technology is no longer an obstacle. The moving image should be a mandatory subject in elementary school. The Children's Film School has become a lab for us running it. We try out and formulate new ideas on education and we practice artistic issue by working together with the children. Kalle Boman - professor at The Film for Directing - initiator. Together with some colleagues he ran a children's film school in his studio i Stockholm during the nineties. Linda Sternö – teacher and former student at The Film School of Directing. Martin Sjögren – film director and student at The Film School of Directing. Jonas Eskilsson – assistant and student at The Film School of Directing. Dan Sandqvist - assistant, photographer and former student at student at The Film School of Directing.